I am fascinated by the overuse of certain words. For instance, I live in Orlando. “World” is used everywhere. There is, of course, Disney World (I believe they started the trend). SeaWorld may lay claim to the title, but it didn’t catch on in San Diego quite as well. There is one in Orlando, too. We have the Orlando World Marriott Center (it is a hotel and convention center). Then there is the newly added Wizarding World of Harry Potter at Universal Studios (they had to get in on the act). Then, there are the lesser known: Ski World, Speed World Dragway, Paintball World, Window World, World Automotive Services, World Bowling Center and, the most obscure, Viking World Orlando. Enough already. It is akin to the use of the word “Super” in January and February. I have been struggling with another word recently. The Great Commission. The Great Commandment. What if we were to pit these two against one another (realizing, of course, they are both valuable to the Judeo/Christian viewpoint)? From an ideological perspective I’m not sure which would win. Many churches subscribe to the Great Commission as their trump card. “Therefore go and make disciples of all nations, baptizing them in the name of the Father and of the Son and of the Holy Spirit, and teaching them to obey everything I have commanded you.” (Matthew 28:19-20a) It is, after all, the last words of Jesus, his parting earthly challenge. We can interpret a fictionalized preamble by him as, “If you didn’t hear anything else I said these last three years, then hear this.” After all we tend to remember the ending of stories, don’t we? A great ending sticks the best. I know many churches who operate out of the Great Commission paradigm. Southern Baptist churches focus (and do it quite well) on conversion and education. When it became stylish a few decades ago for Corporate America to adopt mission statements, the United Methodist Church voted “To Make Disciples” theirs. Many churches have followed suit, not wanting to appear heretical in their interpretation of Scripture. Both Matthew and Mark record a similar version of the Great Commission (Jesus goes fishing in John and meets some people on the way to Emmaus, eventually catching up with the disciples, in Luke). Jesus sends out the disciples two by two with specific instructions in both Mark and Luke, preparing them to do ministry without him. But, otherwise the act of “making disciples” is mysteriously absent from the other accumulated stories of Jesus. So, what about the Great Commandment? Why doesn’t the church use this statement by Jesus as the filter through which all of our church rhetoric passes? Both Matthew and Mark retell the story of the lawyer asking Jesus, “Which is the greatest commandment?” It seems odd that he didn’t say, “Go make disciples,” here. Jesus is definitive in his answer to the question. In fact, he is quoting a familiar passage. It is part of the Shema. “Love the Lord your God with all your heart and with all your soul and with all your mind.” Hebrew parents taught this phrase to their children for thousands of years. While Luke and John don’t record this exchange, both authors record stories of love which become central to their understanding of the mission of Jesus. Many of the parables Luke records positions the central character to extoll uncharacteristic love and understanding towards others, some of whom don’t deserve the love and acceptance received. See the parables of the Good Samaritan and the Prodigal Son. John records Jesus encouraging people to love others in many different instances. In total, the Gospel writers have recorded Jesus saying “love” 51 times. What happens when the Great Commandment is not central to our thinking? Judgement. We begin to select those that are checking all the boxes on their spiritual list, many times leaving out the ones who may need our love the most. Integrity suffers. When our love for God isn’t at the center of all of our actions, then we tend to make selfish decisions (both personally and corporately). And, let’s not forget the equation Jesus set up with the Shema. Jesus said that our love for others and our self equals our love of God. Said another way, if we aren’t loving ourselves and others than there is no way we can love God. 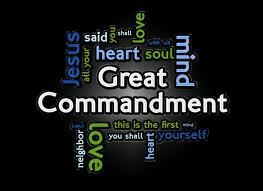 To restate the lawyer’s question, “Which is the Greatest?” The Great Commission or The Great Commandment? The mission of making disciples is easy. It doesn’t require an emotional investment. If we make one disciple we have accomplished the mission. We know we won’t be able to reach everyone in the world. So, we can work our part of it the best we know how, using the gifts God has given us. It is important. Loving others in the manner in which Jesus illustrated and lived is much more difficult. It challenges other contemporary values we have created. We value privacy, security and patriotism (among others). Sometimes loving others means these, and other values, will have to take a back seat. Decisions to love others who aren’t like us or don’t believe in the same things are much more difficult to make. Loving God with our whole being is scary. We can’t do that a little at a time. It is all or nothing. And, isn’t that where greatness emanates? When we are “all in” great things arise.